I’ve created this page so I can link back to Archie’s Feathered Fridays. 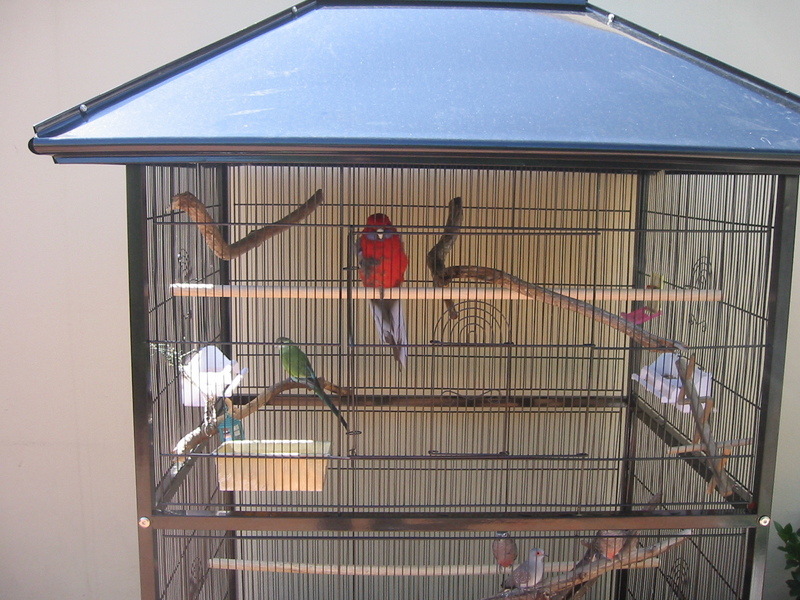 the large red bird is Woody, a crimson rosella who was found on the road many years ago with a badly healed broken wing. woody is tame and thinks he is my life partner, the other birds are his minions and they are not allowed to try and get my attention by singing. He spends his days shepherding them around the aviary and they spend their days trying to outwit him. the vet diagnosed him as neurotic and offered a script for parrot prozac which I declined on woody’s behalf. two years ago we discovered Woody was a cross dresser featherer when she started laying eggs. how coincidental that you should view this page now. I took Woody out of the aviary today for a bit of a treat and when I had my back turned s/he fell off the fourth floor balcony. I was beside myself as the way the wing has set means Woody can’t really fly properly. I have heard that parrots are good at mimicking because they need to join other groups of parrots when they loose their partners. So they learn how to talk like the new family. Hence they have an ear for sounds to mimic.